Alpa is the brand name of successive generations of high-quality 35mm SLR cameras made by the Swiss watch part manufacturer Pignons S.A. It was originally designed by Jacques Bolsky/Bolsey before WW2 and there were several prototypes produced during the war with names like Bolca but the original 'Reflex' and the Standard non-reflex versions were released in 1944-5. The Type 3 Prisma Reflex of 1949 is one of the first prism SLR's made, just after the Contax S but equal with the Rectaflex. It featured a Kern 45 deg. prism and, unusually, still retained a coupled coincident rangefinder. The Alpa was of an unusually solid construction, and featured a cast metal body with figured surfaces. Controls were unusual - the later models had a front-to-back wind lever and a unique extending rewind handle. The back of Alpas is the removable type, held by a central lock. This made it easy to attach specialised backs. Alpa made no lenses but favoured the 50mm f1.8 Kern Macro Switar, an exceptional lens which still commands very high prices and adapters are available to fit it to modern mirrorless cameras and Leica bodies. They cannot be used on other SLR's as Alpa used a very short film to lens mount distance, again to allow the attachment of a wide range of lenses. Lenses were made in Alpa mount by the top European manufacturers such as Schneider, Angenieux, Kinoptik and Kilfitt, as well as smaller optical suppliers such as Enna and Old Delft. A few lenses were made in Alpa mount by Japanese manufacturers Pentax and Chinon. 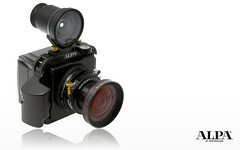 Alpa also sold two Chinon-built SLRs, the Si2000 and Si3000, which used M42 and K bayonet lenses respectively. 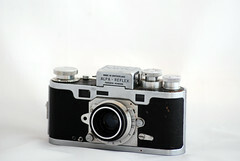 Alpas were very expensive hand-made cameras, made of carefully selected materials, with many variants that could be produced on special order. Their style of niche marketing and bespoke production could not survive the onslaught of autofocus and other electronic innovations. The company ceased camera production in 1990 and liquidation was initiated. Alpa Reflex 6c (new style with uncoupled meter and 90 degree prism). There were several variants of the Model 11 based on metering type (CdS or Silicon cells) and function. The best selling model was the 11a post camera with no finder and a fixed focus lens, and there were several scientific and medical models.